Matt Schultz was elected Madison County Attorney in 2014. Matt is committed to being tough on crime, providing strong leadership, and being a community partner. Matt grew up in West Des Moines and is the oldest of five brothers. While in high school he was an accomplished singer, varsity wrestler, and when he was fourteen years old obtained the rank of Eagle Scout. After high school, Matt was a missionary in Argentina for two years where he learned to speak Spanish fluently. When Matt returned to the United States he received a Bachelor’s Degree, graduating with honors, from the University of Iowa. Matt earned his Juris Doctorate from Creighton Law School and passed the Iowa bar in 2006. While in law school, Matt was elected to the Council Bluffs city council where he served for five years. After law school, Matt worked as an associate attorney for the Omaha law firm, Katskee, Henatsch & Suing, and the Council Bluffs law firm Smith Peterson before he became a partner at the law firm Coats, Schultz & Watson, LLP. Matt had a civil litigation practice. 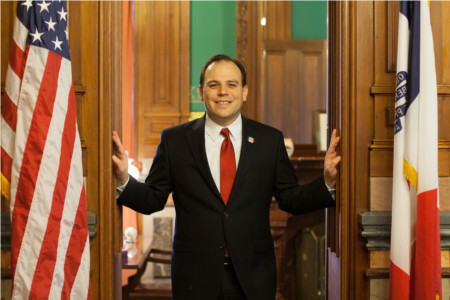 In 2011, Matt Schultz gave up his law practice to serve as Iowa’s Secretary of State, gaining the distinction of being the youngest statewide elected official in the United States. Secretary Schultz focused on streamlining business services, including a new statewide lien registration system, and advocating for the integrity of the elections process, including voter identification. Schultz also worked to increase ease of access to voting for active members of the military. Currently, Matt Schultz is a member of the Boy Scouts of America Mid-Iowa Council Executive Committee, serving as Vice President of Development, a volunteer position. Matt resides in Truro with his wife, their five children, and his mother-in-law.